This week, I’ve been feeling stuck! I’ve had so many work items on my plate – many of which are things I have never done before and are pushing me way outside of my comfort zone – that I’ve been left feeling uninspired and unsure of how to get started on anything. I know I’m not alone in this. I’ve heard from a lot of people this week, both in person and online, who are feeling the same – uninspired and stuck. Whether it’s the news, the state of the world, or the change in weather and daylight, it seems many of us right now are struggling to find the motivation to do the work we need to do. I think it’s natural to feel this way when approaching new things or feeling overwhelmed by choices. And it’s especially difficult when we feel the pressures of time and responsibility weighing on us. We don’t want to make a wrong decision, so our bodies and minds go into freeze mode – shutting down our creativity and our ability to problem solve. We disable ourselves from doing anything, in hopes that it will prevent us from doing the wrong thing. Effective on one level, but not very productive or healthy. And ultimately, it prevents us from discovering the right thing to do – which I truly believe all of us know at our core. So what do we do about this? How do we get ourselves moving again when we’re feeling stuck? Now, I know this may seem like an overly simple or obvious solution. But it is my most tried and true tool to move myself out of feeling stuck and to reignite my creativity. Science teaches us that the act of alternating our feet as we walk stimulates both hemispheres of our brain. This has a calming effect on the body and nervous system, and allows us to process pent up thoughts or feelings. 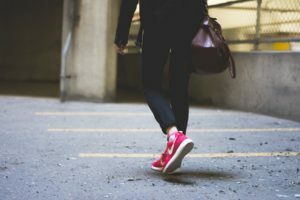 In fact, walking is so good for this that it is widely studied and used as technique in trauma therapy. But on a simpler level, in the act of getting up and moving our bodies, we are literally becoming “unstuck” – we are moving ourselves from a place of stillness and inaction, into a place of movement and action. And where our bodies go, our minds will follow – with all the thoughts, feelings and creativity they possess. So try it out! Next time you’re feeling stuck, unable to make decisions or lacking creativity – go for a walk. For me, sometimes a couple of laps around my apartment or a quick trip around the block is all I need to get things flowing again.